CineMusicking, a portmanteau of Cinéma vérité and Musicking, is an ecological approach to digital ethnographic filmmaking for music research and teaching in critical youth studies. The methods of CineMusicking were developed as a way of undertaking research about ecologically embedded lived personal experience. This method makes use of Gregory Bateson’s work on ecology as it was developed in ethnomusicology by Christopher Small and, in a separate development, biosemiotics. The goal of this method is to explore the coupling and subsequent formation of individual consciousness and culture within a semiosphere-biosphere matrix, what I call the matrix that embeds. I will show through discussion of the production of three of my original ethnographic films Megamorphesis, Letters to Attawapiskat, and Pimachihowan, that ecological ethnographic films made with youth can co-create an ecological aesthetic education with the potential to be deeply transformative for themselves, their schools, community, and environment. CineMusicking, a portmanteau of Cinéma vérité and Musicking (Small, 1998), is an approach to ethnographic film production as a form of ecological critical pedagogy. Cinéma vérité was developed by ethnographic filmmaker Jean Rouch and made possible by portable sync-sound film cameras and by “deliberate intrusion” (Heider, 2006, p. 31) into a social world by filmmakers. Musicking was formulated by ethnomusicologist Christopher Small, building on Gregory Bateson’s Steps to an Ecology of Mind (1972). Small recognized in Bateson a new way of thinking about the study of music, one that is based in an ecological orientation. Small argued that music is not a noun, but a verb – a system – and the notion that music is a noun has gotten in the way of a proper understanding of musicking as an ecological system within systems. This reorientation follows Bateson’s definition of ecology as the study of an organism in its environment and provides a new way of studying the role of music in youth culture. For a relational ontology of consciousness, I turn to Jean-Paul Sartre’s existentialism, for a relational ecological ontology of the body and community I turn to biosemiotics, and for community-based method that help make explicit these implicit processes, I use Paulo Freire’s critical pedagogy. By doing this I am able to provide a systematic framework for the filmic study of music in ecology that does not exclude either the prepersonal or the biosphere. 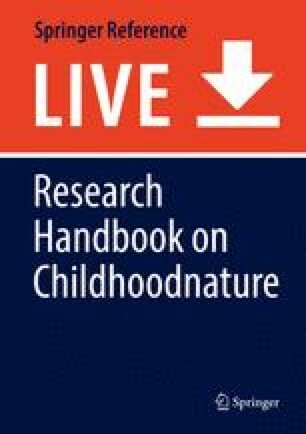 CineMusicking forwards an ecological existentialist ontology and ethic for the production of educational ethnographic film about music cultures, and “Rouch’s technique of showing people reacting to their own images has rarely been followed up in any systematic way” (Heider 2006, p. 32).). CineMusicking utilizes biosemiotics as a way of getting above the culture/nature binary, where endo- and exosemiotics joins science and social science together in a joint program with the potential to contribute a rich interdisciplinary starting point for the study of the matrix that embeds. The methods of CineMusicking began when trying to communicate my hip-hop research with the inner-city youth with whom I was working. After 5 years of close contact at an inner-city drop-in program, the youth no longer wondered why a professor sat among them. But I was also aware that despite my explanations, I could not communicate the uniqueness occurring in this particular hip-hop cypher. In my book, Remix and Life Hack in Hip Hop (2016), I explored the production of an aesthetic system that produced hip hop as well as hiphoppas. I worked with youth to write histories, interview long-time hiphoppas, to document the operation of the hip-hop cypher, and finally to theorize the production of subjectivity within this system. The youth, however, were not going to read my book, nor was it written for them. I decided to bring in a video camera and to make a film about the work I was doing with them so that I could show them what I saw, that the hip-hop cipher is an existential situation, and that it shared with Paulo Freire’s culture circle, a pedagogical goal. On the first instance of filming, I set the camera and posed a question: “Who is more powerful, your civilian self or your hiphop self?” The youth required no further explanation; they had all developed a hip-hop self; Daniel was DNA, David was ViceVerser, Andre was Dre Pharoh, and Mike was Eflow. In each instance, they articulated the moment or moments where another self was brought into being. They did not require a master class on existentialism to know that “existence comes before essence” (Sartre, 2007) and that the existential situation is “self-making-in-a-situation” (Fackenheim, 1961, p. 37). Nor did they need to be told that “freedom is acquired by conquest, not by gift” (Freire, 2000, p. 47), nor that they are living in a time that treats youth as “disposable” (Giroux, 2011, pp. 89–107). They had already learned that “concrete thought must be borne from praxis” (Sartre, 1963, p. 22) and had been learning to live hip hop – learning to write and spit rhymes – in ways that would help them critically understand and play a role in shaping the ecology of the city in which they live. Hip-hop practice contributes a pedagogy of freedom located in the knowledge of the “unfinishedness of the human condition” (Freire, 2001, p. 66) and their capacity to self-create (Fig. 1). After this initial screening, I began to take the film to a wide variety of places including university classrooms, community centers, research centers, and film series. Each time I screened the film, the conversation that followed was rich and penetrating. Discussion always began with the feeling of proximity that the film created for the viewer, the feeling of being there. And then moved outward to think about the social situation of the youth, the environments in which they live, and the potency of their struggle. In the depths of each conversation, I saw more and more clearly how powerful, and ecological, the film situation can be. A few months passed and in the news, alarming stories of youth suicide at the Attawapiskat First Nation in Northern Ontario, Canada, began to circulate. 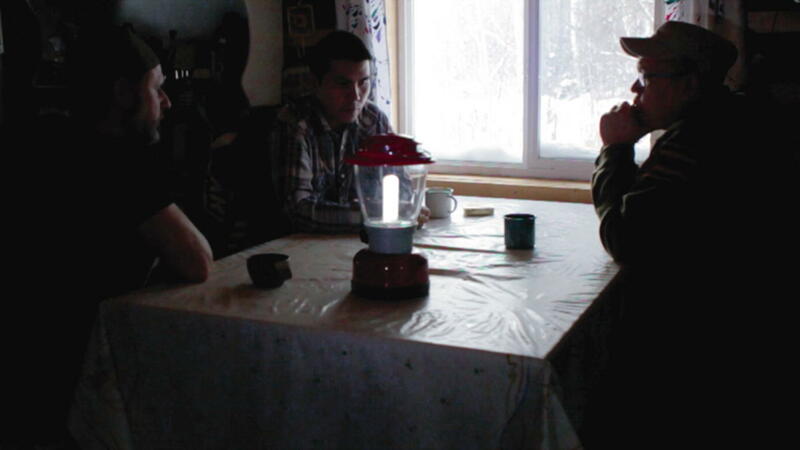 The members of Cipher5 decided to organize a letter writing initiative, to send personal letters to Attawapiskat youth. Dre reached out to me to return with my camera. This time the youth themselves decided what the film needed to be. Together we made Letters to Attawapiskat, a film that explores the ongoing hurt of colonization, intergenerational trauma, and the role of the hiphoppas and of hip hop in creating a new civilization (Fig. 3). I began screening Megamorphesis and Letters to Attawapiskat together. 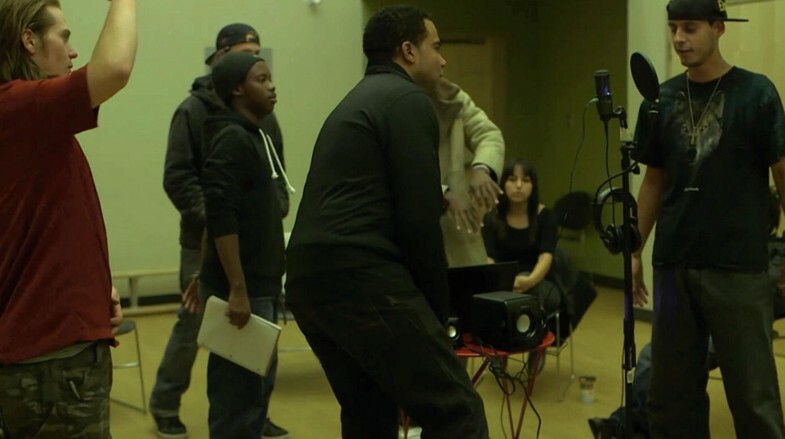 The films feature inner-city youth speaking about their understandings of the world and the role of hip-hop music in their lives and in the lives of those they know, and they also speak about the ways that they see themselves nested in a complex and sometimes predatory ecology. This new civilization is not a small matter. In many ways Cipher5’s new civilization is an ecological critique that locates aesthetics and healing, not reason and conscious purpose, at its center. While Bateson was among the first to talk about the transformative healing power of an ecologically embedded ethico-aesthetics, he did so as an antidote to the ecological degradation caused by conscious purpose, a consequence we are now calling Anthropocene. The negative consequences of conscious purpose can be seen in the emergence of the concept Anthropocene which has come to describe the Earth’s current geological epoch (Steffen et al., 2015) (This has been dealt with in more detail in my 2016 book Playing for Change: Music Festivals as Arts-based Community Learning and Development.). And while it seems that what we thought we knew about the environment has all been thrown into doubt, I want to illustrate that the narrative that is emerging about the Anthropocene is problematic or at least not fully formed. If we undertake a political economy of the Anthropocene, it becomes evident that the so-called Great Acceleration that began in the late nineteenth century has introduced an epistemic-ecological illness that is ecologically predatory. It is essential to begin our discussion of environmental aesthetic education on this very shaky ground in order to first face up to the impact of conscious purpose, before we can introduce a biosemiotic aesthetic education capable of challenging the aesthetic subjectification that continues to contribute to predatory Anthropocene. Anthropocene is defined by human action that is, for the first time in the history of the planet, having a direct impact on climate and the environment. This impact marks the conclusion of the geological epoch called Holocene that lasted 11,700 years and included the entire evolutionary history of human civilization. Particularly striking evidence was forwarded in Steffen et al.’s (2015) “The Trajectory of the Anthropocene: The Great Acceleration.” They showed that rising rates of 12 human systems mapped directly onto 12 earth systems, and these increasing rates of impact began after the Second World War (Source: International Geosphere-Biosphere Programme http://www.igbp.net/globalchange/greatacceleration.4.1b8ae20512db692f2a680001630.html). The Great Acceleration was the expansion of socioeconomic activity turbo charged by increasing resource use that created new technologies that further expanded rates of consumption. This was a celebrated new socioeconomic phase that was supposed to lead to full employment and a bright future for all. It was also the beginning of a next phase of the capitalist world-system accelerated by increasing urbanization. By 2008, humanity officially entered a new urban phase where 50% of the earth’s population lives in urban spaces. John Bellamy Foster, York, and Clark (2011) argued that capitalism has produced an ecological rift caused by a core of the capitalist world-system out of step with ecological resources and its system thresholds (Particularly concerning is of course the carbon dioxide limits, and this is much discussed. But more concerning are some of the other earth systems like nitrous oxide, methane, ocean acidification, and coastal nitrogen. We are not having a public discussion about the correlation of these systems nor the possible impacts that may arise from breaching their limits.). The Great Acceleration produced a staggering amount of wealth that benefitted a very small percentage of people. In 2010, OECD countries had 18% of the earth’s population but accounted for 74% of GDP. But it is reported that only 0.1% controlled this vast wealth. This is illustrated in the 2015 Oxfam-released Working for the Few (https://www.oxfam.org/en/research/working-few), a terrifying document that shows “almost half of the world’s wealth is now owned by just one percent of the population,” that “the bottom half of the world’s population owns the same as the richest 85 people in the world,” (2) and that this already extreme economic disparity is getting worse. So, while it is clear that everyone will be impacted by the implications of Anthropocene, its causes and the economic value that emerges from these impacts are not equally shared. A new form of ecological inequality has developed (As I have discussed elsewhere (MacDonald, 2016a, b), social scientists already know that human impacts on the earth are not equally disseminated across the globe and locations of resistance often located in capitalism’s periphery are beginning to emerge. While environmental scientists study environment impacts, and environmental studies and environmental activists politicize governments and society to these impacts, social scientists from within a critical theory or cultural studies tradition have an opportunity to talk about what Niklas Luhmann calls “ecological communication” (1989). Social scientists in many disciplines are beginning to develop new approaches informed by this emerging data. Ecomusicology is one example.). Predatory Anthropocene (PA) is the consequence of an epistemic illness. It is manifest as a crisis of the environment, the economy, and the human organization, occurring within communication. The source of predatory Anthropocene is the radical revolution in the semiosphere, the new languages, new discourses, new knowledges, and new politics of capitalism (Lazzarato, 2014, p. 16). Gregory Bateson provided a foundation for a way of studying these impacts on the semiosphere. His work has been expanded into biosemiotics and approach that I see as foundational to CineMusicking. This expanded notion of ecology that locates the semiosphere within the envelope of the biosphere, in an interactive way, helps explain the operation of predatory Anthropocene and its maintenance in popular culture. It also provides a way to explain how youth hiphoppas in Cipher5 are able to recognize that their self-work is able to build a new civilization. Moving out from Megamorphesis to Letters to Attawapiskat sketches out two levels of semiosphere. I followed these films with Pimachihowan that explores the role of Cree traditional ecological knowledge (TEK) and learned about the ecological aspects of the matrix that embeds. Previously, I had been sketching out a semiosphere without thinking very clearly about the recursive relationship between semiosphere and biosphere. I could see the impact of semiosphere on the biosphere, but I had not yet seen that the biosphere may also shape the semiosphere which would also be shaped by individual choices. The study of Cree traditional ecological knowledge taught me this, and trying to find a path that walks in parallel with Cree TEK brought me to biosemiotics. Biosemiotics “is the name of an interdisciplinary scientific project that is based on the recognition that life is fundamentally grounded in semiotic processes” (Hoffmeyer, 2008, p. 3). Built upon the work of Charles Sanders Peirce, Jakob von Uexkull, and Gregory Bateson, it offers “path-breaking new ways of understanding both culture and nature” (Ibid.). Central to the biosemiotic approach is the position that “living nature is understood as essentially driven by, or actually consisting of, semiosis, that is to say, process of sign relations and their signification – or function – in the biological processes of life” (Hoffmeyer, 2008, p. 4). This provides a radically new platform for ecological aesthetic education (There is, however, a significant distance between music education and ecological music research on the one side and systems science, like biosemiotics, on the other. In Canada, praxialism is the dominant music education philosophy, and it denies a place for aesthetics. Ethnomusicologist Christopher Small brushed up against second-order cybernetics in Musicking. And while the concept has become widely used, its relationship to cybernetics is unknown. Ethnomusicologists have generally agreed that music “is a key resource for realizing personal and collective identities which, in turn, are crucial for social, political, and economic participation” (Turino 1999). While some ethnomusicologists utilize Peircean semiotics in their methods research in this orientation has tended toward identifying formation, and while this is undeniably important, it is only one part of communication. Ecological (ethno)musicology, in the form of the new subdiscipline ecomusicology, while the most likely candidate for systems science has utilized ecocriticism as its dominant framework. In this essay I seek to forward one response to these three threads. First, that music education might expand its practice beyond its rigid allegiance to studio practice and performance-based pedagogy. Second, that Peircean ethnomusicology might find resonance in biosemiotics and contribute ethnographic research to studies of human signification and, third, that ethnomusicology might benefit from rethinking “nature,” by reorienting toward biosemiotics.). The goal is to get above the humanist binary of nature/culture in the recognition that semiotics is not exclusive to humans but is in the biological environment, a semiosphere, within which humans have evolved unique complex practices of symbolic learning in “cultural sign processes [that] must be regarded as special instances of a more general and extensive biosemiosis that continuously unfolds and acts in the biosphere” (Hoffmeyer, 2008, p. 4). Instead of thinking about “nature,” biosemiotics allows us to inquire after the recursive impacts of semiotics phenomenology (art in this case) in the shaping of the semiosphere and how the semiosphere is functionally coupled (Luhmann, 1989, 1996, 2000, 2009) and embedded inside the envelope of the biosphere. The semiosphere is not undifferentiated; different semiospheres are produced recursively through the engagement of ways of acting within the biosphere. We call the collection of these thoughts, dreams, symbols, and actions culture. The cybersemiotic perspective (Brier, 2008) builds upon biosemiotics by including Niklas Luhmann’s Social Systems Theory (1996) which allows us to pose evolutionary questions about the role of art in the semiosphere without resorting to reductive biological questions of evolution, i.e., sexual selection. Instead, a cybersemiotic question would ask about the recursive role of expressive practices in meaning creation about the environment; how it contributes to, and about the semiosphere, how changes in the semiosphere require the semiotic organism to respond as we attempt to shape the semiosphere to successfully integrate into the biosphere; and whether we are able to even tell what is successful. The evolutionary role of language signification and of its expansion across textual, aural, visual, and gestural modes, as we currently engage with them in popular culture, requires significant transdisciplinary research. One of the most pressing cybersemiotic questions regarding aesthetics is the impact of capitalism on signification and the semiosphere-biosphere matrix (It has been long acknowledged that aesthetics has been incorporated into integrated world capitalism (Adorno 1984, 1991; Adorno, Benjamin, Bloch, Brecht, & Lukacs, 1977; Benjamin 1968; Guattari & Rolnik, 2008). It has recently been argued that new forms of information workers, that some call the cognitive proletariat or the cognitariat (Lazzarato 2011, 2014, 2015; Marazzi 2008, 2011a, b), are being trapped in decentralized creative/semiotic factories working for capital accumulation, profit that benefits “creative” industries’ executives. What began with the rise of neoliberalism has become the information economy, the gig economy, built upon precarious creative labor within a growing sector of the global economy extending into self-driving vehicles and expanding automation.). Gregory Bateson (1972; Bateson, Jackson, Haley, & Weakland, 1978) has shown that the definition of the living organism is provided by the organism itself and that although the organism is self-aware, it does not follow that its actions and its environment are evident to the self. Further, because the organism is a self-reflexive (second-order) system, its environment can be known, and its history known, only through the resources available to it within its system (Von Foerster, 2003, 2014). Further, what the organism uses to know its environment (resources it has made for itself) contributes to autopoiesis (self-creation) (Maturana, & Varela, 1987). But as Bateson warns, self-awareness does not provide a privileged claim to ontology, and the community does not get access to its ecology. The maps are only what they think they know and are always in a virtual relationship to the territory. Accepting Bateson’s observations about the problems of self-awareness, it is necessary to clarify the capacity of critical theory, which provides the critical theorist a privileged critical vision that has remained largely unquestioned. Further, some strong forms of critical theory have turned everything into discourse. While it is necessary to talk about the construction of discourse, when taken to an extreme, it makes the mistaken claim that the biosphere, and all of the science dedicated to its clarification, is a construct of discourse. The result of this strong approach to discourse is the incorrect and dangerous belief that changing the discourse alone is enough. Unreflective science that has claimed a monopoly on the real also has a strong form that does not see the place of human semiosis in knowledge production. As semiotics has shown, our biological engagement with the world is based upon humanly produced maps of territories that we can never have access to with our analysis. All of our knowledge is a map of a territory. The tension between the strong humanities and strong science position is a continuation of C.P. Snow’s Two Cultures problem (1998), where science believes that its analysis of nature and the universe is comprised of information and that there is no meaning. Social science and humanities believe alternatively that they are studying culture and society and that meaning systems are only located in discourse. The problem of the two cultures is not a problem of personalities but is a problem with the entire framework of knowledge production. If ecological aesthetics is going to deal with both ecology and aesthetics, a framework that includes both science and semiosis is necessary. Cybernetics was developed as an interdisciplinary initiative to bridge the two-culture problem. The major theoretical contributions were cybernetics and systems theory which were expanded upon by second-order cybernetics, a system where self-aware observers of the system include themselves in the system, as with Maturana and Varela’s (1987) theory of autopoiesis (self-creation). Niklas Luhmann (1989, 2000, 2009) built systems theory and autopoiesis into social systems theory. In a parallel development, biosemiotics was developed. Soren Brier brought Luhmann’s work together with biosemiotics to develop cybersemiotics, a portmanteau of cybernetics and biosemiotics. This approach articulates levels of semiosis that joins science and social science and humanities together. Biological autopoiesis occurs through endosemiotics seen in DNA, for instance, psychological autopoiesis uses neurosemiosis, the communication of the nervous system and organs of the body. These endosemiotics are related to the exosemiotics of the social system and the relation of the social system made up of members of the same and different species (zoosemiotics and anthroposemiotics) and its semiotics coupling with the biosphere. Von Uexkull remarked that “Organisms are wrapped in semiotic networks in which specific circulating signs are accessible on to complementary systems of interpretation. The exosemiotic sign processes, which transform the objective environment into subjective universes, are intrinsically related to the endosemiotic sign processes in a continuous basis” (Barbieri, 2008, p. 366). And if this was not complex enough, we are now facing a three-culture problem with the awareness that traditional ecological knowledge (TEK) has been maintained through songs, stories, foodways, and Indigenous epistemologies as a body of evolutionary ecological knowledge. This is knowledge about a biosphere in which Indigenous people are embedded and have been for as much as 15,000 years in Western Canada. The development of ecological aesthetic education within predatory Anthropocene needs to have the three-culture problem on its horizon. I propose cybersemiotic ethnographic film as a research methodology capable of addressing the three-culture problem. In the final part of this essay, I will discuss the journey of making my film Pimachihowan and the ways that ethnographic film (In an interest to finally get to the main subject of the paper, I will spare the reader a survey and discussion of the work written about ethnographic film though important is a methodological discussion that will have to await a follow-up paper.) can provide a valuable method for researching as well as practicing cybersemiotics. Pimachihowan began as an ethnographic film contribution to a web-based petroleum education learning tool (PELT). PELT was a federally funded research project headed by business ethics professor Dr. David Lertzman and partnered with Cree elder Conroy Sewepagaham, to explain to business students, destined to work in the Alberta energy sector, the complex sociocultural-economic environment they are about to enter. David, Conroy, and I began working through potential ideas for the film, but after a few failed attempts, it became clear that the traditional documentary approach was not going to work. A central complexity was that the film’s goal was to explain Cree traditional ecological knowledge to people who do not have the framework for understanding it. Canadian energy sector professionals come to Indigenous communities understanding that they have a responsibility for consultation and accommodation. But these two words are not translatable in the Cree language. So, these students came to learn expectations that are often difficult to meet in the field. Over the process of David and Conroy’s work, it was agreed that Cree words would have to form the center of the film. We began to work toward developing a film method that would have the capacity of being ecological in the same way that the hip-hop films would be. In the process of developing the method, I began to see that once again it was necessary to utilize the CineMusicking method. That I was not exploring music explicitly was made unnecessary by Conroy’s observation that in Cree TEK, all education is ecological aesthetic education, not of nature but of our relationship with the matrix that embeds (Fig. 4). In the short educational film The Matrix that Embeds, Humberto Maturana and Heinz von Foerster explain that the form of the described universe is shaped by the tools used to do the describing (“The Matrix that Embeds” Humberto Maturana and Heinz von Foerster, American Society for Cybernetics and Change Management Systems. Directed by Pile Bunnell 1998. https://www.youtube.com/watch?v=acx-GiTyoNk (accessed March 19, 2017)). In other words the method taken to describe the universe is therefore not just one method among many that will lead to the same end, but is a choice, made often with little foreknowledge of the consequences the method will have for the model. In particular, von Foerster explained that the root word of science (skei) means to take things apart as in schism and schizophrenia. While taking apart in the act of naming produces a universe of parts useful to its itemization, this method does not necessarily lead to understanding of the ecological productiveness. There is sometimes a confusion between mechanical science and living science. For instance, if you take a car apart in your driveway and take very close notes, you can reassemble it based on your very close notes, and it will restart. Attempting this on your cat will not produce the same result. Another method is necessary. The opposite of skei is the root syn, to unify, to put together, as in the root of system. In Steps to an Ecology of Mind (1972) and Mind in Nature (1979), Gregory Bateson presented systems of interconnected “minds” established upon the pattern that connects. In his later work Where Angels Fear (1987), he and his anthropologist daughter Mary Catherine Bateson explore aesthetics and sacredness as the experience of being embedded in human-animal-planet matrix (Charlton, 2008). Bateson’s ecological view was of the whole and had to “accommodate aesthetics to the question of consciousness” (Harries-Jones, 1995, p. 212). He argued aesthetics and consciousness were two parts of a necessary triad with the sacred. Harries-Jones, summing up Bateson, wrote: “The sacred (whatever that means) is surely related (somehow) to the beautiful (whatever that means) in that the sacred is a sort of surface, or topology, on which both terms, beauty and consciousness could be mapped” (212). Following Bateson, it is possible to inquire after questions of aesthetics through the sacred, as the pattern that connects. The pattern that connects allows for a view of parts and wholes; it is the study of the connections between things. Heinz von Foerster, however, did not feel that the paternal association of pattern, from the root pater meaning father, was the correct metaphor. Pattern presupposes a master form, a maker (Platonic forms?) capable of cutting out parts. Instead of father (pater/pattern), Foerster suggested mother, mater or matris, from which a system emerges as wholes, built of relations-of-difference that embed. Instead of a pattern (pater), von Foerster suggests matrix (mater) and substitutes the pattern that connects for the matrix that embeds. The change of metaphor from father science to mother matrix introduces a new approach to ecological aesthetics that works in parallel with traditional ecological knowledge of Indigenous peoples in Canada and maybe more broadly (Because of the colonial history of Western rationality, in both science and the humanities, meta-questions for researchers in post-Truth and Reconciliation Canada are of great ethical, epistemological, and methodological importance. Indigenous writers have long recognized the negative impacts of skei, the tearing apart of “things” in Western rationality. In “Custer Died for your Sins” Vine Deloria Jr. (1969) critiqued colonial scholarship when he wrote: “Into each life, it is said, some rain must fall, some people have bad horoscopes, others take tips on the stock market, but Indians have been cursed above all other people in history. Indians have anthropologists” (78). Although Treaties 6 and 8 were signed between Indigenous peoples and the Canadian government as an agreement to share the land and to provide Western education, these treaties were systematically ignored. The promised education was delivered in the form of a system of residential schools dedicated to “kill the Indian in the child;” European aesthetic education was used as an epistemological weapon. The federal government apologized in 2008. Soon after, the Truth and Reconciliation Commission of Canada traveled across the country to hear and record testimony of the impact of residential schools. Concluding in 2015, it is now public record that Indigenous people were physically, psychologically, and sexually abused in a government-supported system of cultural genocide. However, while the government says “we are sorry,” treaty obligations as of 2017 are still rarely lived up to. What’s more, the epistemological operation of colonization remains opaque. It is this field that I am seeking to theorize aesthetic education not in the hopes of explaining traditional ecological knowledge but instead of contributing to an allied ecological aesthetic education.). For instance, when Sewepagaham talks about Kimaamanow (This is not a Cree word but instead is Michif, a complex language comprised of Cree and French. It is not a patois that mixes and reduces the complexity of two languages into one hybrid but is instead a language that was built by expert speakers of both Cree and French and therefore has very complex grammar structures. ), there is some hesitancy with the often-used translation mother earth. I believe the hesitancy comes from the fact that the English words do not quite capture what is being expressed. Matrix with its root in matris brings us closer than the English word mother. The process of engaging with the matrix that embeds is part of the practice of life called Pimachihowan, experienced as sacredness. With our teachings, it is subtle. 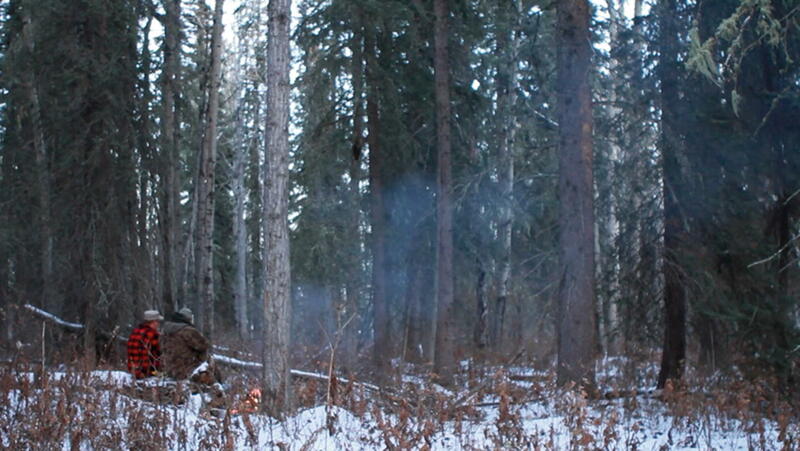 If it’s walking down through a boreal forest or tracking down a game animal it’s soothing. It’s totally opposite to what youth are now being engaged on. It’s not ‘bam’ right in your face, here’s a frag grenade, ‘boom’ you have instant reaction. With our teachings it’s calm, it’s soothing, it’s pah’pe’ya’ht’ik, slow, it’s like steeping your tea. You don’t rush it because it doesn’t taste good. It’s like that, our teaching needs to steep nice and slow. It takes time. So when you ask how can we teach that to non-indigenous folks or even with our people who are not able to be granted that kind of teaching, how do we do that, at the end of the day we have to teach them patience. You don’t get an instant reaction, you’re not going to get instant gratification. When you go out and walk on the land and say ‘here it is’, you’re not going to go out there and say ‘wow I’m changed’. You have to do it repetitively, you have to do it over the years. It’s slow healing and without the slow healing it’s not true healing. Showing this distinction in the film was complex and relied upon the Cinéma vérité method. In one scene, we followed Conroy walking through the deep snowy woods of the northern boreal forest, breaking large branches as we moved. Eventually, and without warning, Conroy stopped and began making a fire. He made a space in the snow and started to stack pieces of wood; he added some cotton synthetic fur from his gloves and lit it with a lighter. David asks, “can you tell us about Pimachihowan?”, and Conroy responds: “We’re doing it right now” (Fig. 6). Conroy explained that nothing starts on its own, that we are all just like the fire, and that we are all in relation to each other. He goes on to explain that a key teaching of Pimachihowan is that if we respect the environment then we learn to respect ourselves, and if we respect ourselves we learn to respect the environment. We realized that Conroy is teaching us Cree TEK. As a filmmaker, I realized at that moment what Conroy had decided to do; he had chosen to “perform” TEK for the camera. In the process of filming and editing the film, we learned that slowness provides an opportunity to interpret your ecology using all of your capacities. Your senses, feelings, dreams, memories, and knowledge. I edited the rest of the film with this in mind. Everything was edited for slowness, to allow time for new ideas, observations, and feelings to emerge. I learned in the process that slowness was not just tempo, but a space of productivity. Long takes were utilized throughout. It is with great satisfaction that the feedback I regularly receive from audiences is focused on the tempo of the film, the feeling of being there, of sitting next to Conroy. In the second half of the film, titled Kawitapmatoa (sitting down with people), the approach to the film direction explicated the central notion. David and Conroy were joined by Willard Tallcree, and they sat down together at Conroy’s family’s hunting cabin deep in the boreal forest. We learn more about the continuity between how we live and the wellness of the environment. That colonization and the impacts of Indian Residential Schools have emotional as well as ecological ramifications for all people and that the impacts of colonization are not over until we are both healed, settler and Indigenous alike. These observations map on completely with the observations made by the hip-hop youth in both Megamorphesis and Letters to Attawapiskat (Fig. 7). When I screen Megamorphesis with Pimachihowan, questions emerge about youth migration, rural to urban, and youth living in Indigenous community and then moving to metropolitan multicultural community. Youth tend to respond in either two ways. Non-Indigenous youth tend to be amazed that there is a hip-hop culture that is influenced by Cree TEK. For youth who understand hip hop exclusively as a product of American popular culture industries, it is quite a surprise to recognize that hip hop is formed by the ecology within which it is embedded. They are surprised because they are used to not thinking about the environment, because they do not yet have the capacity of thinking about semiosphere-biosphere coupling. Indigenous youth are often very happy to see this connection made and often explain authoritatively to non-Indigenous members of the audience details about their lived experience. In such a way, at-risk youth who are often the least empowered find a central place in a public educational environment. Following Paulo Freire’s methods, the oppressed are able to find voice in their lived realities and in doing so dissolved the bonds that holds oppressor and oppressed in their places. The films help Indigenous inner-city hiphoppas talk back to power, to help make explicit the implicit epistemologies of hip-hop culture and traditional ecological knowledge. And we are able to do this together because we have set out to make ethnographic films together. To understand ourselves more deeply as we put ourselves on screen and then share our journeys with audiences. I began making ethnographic films during my graduate work as a way of doing aesthetic research that could communicate outcomes that print publications, no matter how literary, could not communicate as effectively or as ecologically. When I began incorporating my ethnographic films into my teaching, it was with great effect. My students not only began to see what I was researching but began to report that they “felt” as if they were entering into someone else’s lifeworld. I have found that the affective impact of film can be molded through editing into a variety of phenomenological forms that are sometime intersubjective and sometimes ecological. I am increasingly convinced that CineMusicking is not only an excellent vehicle for communicating cultural research in aesthetics, but it provides a two-sided opportunity for aesthetic education. First, because of the immediacy and multimodality of film, it is an excellent technology for ecological and intersubjective aesthetic education. The second side is that through ecological ethnographic filmmaking, young people can gain an aesthetic education that has the potential of being deeply transformative for schools, young people, their community, and environment. CineMusicking is an inherently interdisciplinary practice for aesthetic education. It draws together all of the traditional forms of aesthetic education: visual art, theater, theater production, music, composition (screenwriting), and new forms of aesthetic education like audio recording, video editing, coding, design, and communications. Through CineMusicking young people can produce films about their environments and communities, and by doing so, they engage in the research of the semiosphere that may help their communities and themselves understand their world in ways not currently accessible. Finally, we live in a time when digital film production equipment costs much less than even maintaining a traditional music program (and dissemination by Vimeo is almost free), but most schools do not make film production a priority. Perhaps it is because Hollywood so controls the stories we tell ourselves about ourselves that we are unable to imagine what aesthetic education could look like after we take control of our own narratives. Perhaps it is a lack of ecological aesthetic education philosophy. 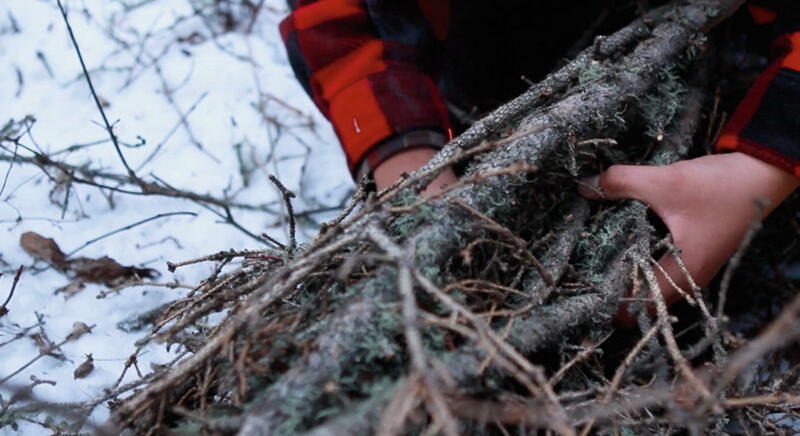 This chapter takes one small step toward this emerging film-based ecological education.